The Peasants’ Revolt of 1381 is one of the great watershed events in English history. This anonymous sixteenth-century play follows Jack Straw, Wat Tyler, and the rebels as they march on London to confront the young Richard II. This anonymous play is believed to have been written sometime between 1585 and 1591, perhaps for a public pageant performed before the Lord Mayor of London, whose predecessor, William Walworth, is a hero of the play. It was entered on the Stationers’ Register on October 23, 1593. The earliest printing, from which the later 1604 printing appears to have been set. Appears to be copied from the 1593 edition, reproducing its errors and including additional ones. 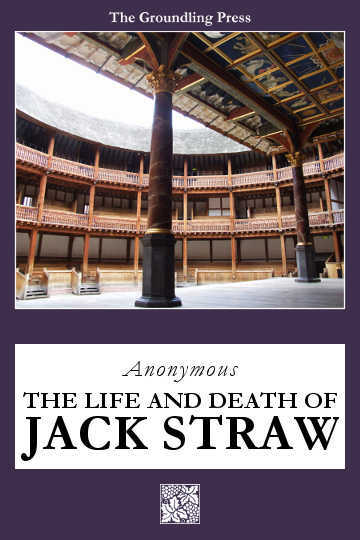 The Life and Death of Iacke Straw, a notable Rebell in England: Who was kild in Smithfield by the Lord Maior of London. Iohn Danter solde by William Barley. 1593. The colophon bears the date 1594. B.M. (C. 34. b. 46). [Another edition.] for Thomas Pauyer. 1604. Bodl.